Astronauts Class - Universe Galaxies And Stars Section. NASA named its latest batch of astronauts; the 11 candidates include three teachers, who were selected from over 1,000 candidates. The introduction of the new astronauts comes at a time when the Space Shuttle fleet is still grounded because of the Columbia disaster - they probably won't fly until 2009. The candidates are Joseph Acaba, Thomas Marshburn, Christopher Cassidy, R. Shane Kimbrough, Jose Hernandez, Robert Satcher, Shannon Walker, James Dutton, and Randolph Bresnik. 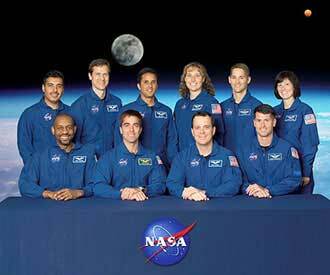 Eleven new Astronaut candidates are joining the ranks of space explorers. NASA introduced the new class during a Space Day celebration today at the National Air and Space Museum's Steven F. Udvar-Hazy Center in Chantilly, Va. The class of 2004 will be the first focused from the very beginning on realizing the new Vision for Space Exploration. NASA Administrator Sean O'Keefe called members of the new Astronaut class, "our next generation of explorers, who'll help blaze a galactic trail through the solar system. "We are indeed living in an age of heroic potential, as we move forward in the solar system to explore mysterious new worlds, make important new discoveries and help to expand the sense of possibility for all humans on his planet," O'Keefe said. Former Astronaut and U.S. Sen. John Glenn, who introduced O'Keefe, looked back, and ahead. "How far we've come in the past few years," he said, "how far we yet have to go, and how much we have yet to learn. I'm envious of the young people just coming into the space program now for the opportunities that they have." The class includes pilots, mission specialists (MS) and three new mission specialist-educator (MS-E) astronauts, teachers who will help ensure there's always a next generation primed to explore. # Mission Specialist-Educator Joe Acaba: A 36-year-old teacher at Dunnellon Middle School in Florida and a former Peace Corps volunteer in the Dominican Republic. # Mission Specialist-Educator Ricky Arnold: A 40-year-old math and science teacher at the American International School of Bucharest, Romania; he's also taught in Morocco, Indonesia, and Saudi Arabia. # Pilot Randy Bresnik: A 36-year-old Marine Corps major, F/A-18 pilot and experimental test pilot who's getting married this month in a Scottish castle. # Mission Specialist Chris Cassidy: A 34-year old Navy Seal who has done two tours of duty in Afghanistan. # Pilot Jim Dutton: A 35-year-old U.S. Air Force major and F/A-22 test pilot who flew combat air patrols over northern Iraq in the 1990s. # Mission Specialist Jose Hernandez: A 41-year-old engineer at NASA's Johnson Space Center in Houston; grew up as a migrant farm worker before settling in Stockton, Calif.
# Mission Specialist Shane Kimbrough : A 36-year-old U.S. Army major and flight simulation engineer at NASA's Johnson Space Center in Houston; served as a platoon leader in an Apache helicopter company during Desert Storm. # Mission Specialist Tom Marshburn: A 43-year-old flight surgeon at NASA's Johnson Space Center in Houston; also an avid mountain climber and a private pilot. # Mission Specialist-Educator Dottie Metcalf-Lindenburger: A 29-year-old science teacher at Hudson's Bay High School in Vancouver, Wash.; she was a championship runner in college. # Mission Specialist Bobby Satcher Jr.: A 38-year-old M.D. and orthopedic surgeon at Northwestern Memorial Hospital in Chicago; he's done charity medical work overseas. # Mission Specialist Shannon Walker: A 38-year-old Ph.D and manager at NASA's Johnson Space Center in Houston; she's lived and worked in Russia, and is an avid private pilot. After their formal introduction, the new Astronaut candidates joined students from NASA's Earth Crew at an afternoon webcast from NASA Headquarters. The kids introduced the class and showered them with cheers and confetti. Also at that event, NASA's Deputy Administrator Fred Gregory read a special Space Day message from President Bush, congratulating the class and praising "America's spirit of discovery and innovation." The candidates will report to NASA's Johnson Space Center this summer. Once settled in Houston, they will begin the intensive training. Initially, they will undergo land survival training, T-38 jet ground and flight training, Shuttle orbiter systems training, Space Station systems training, science and engineering briefings, and orientation tours at all NASA centers, including the Kennedy Space Center and Marshall Space Flight Center. "These are the men and women who will help us 'extend life to there,'" Readdy said. "Naming this new class is an important next step in our exploration goals." "Right now, tomorrow's space explorers are seated in America's classrooms. As NASA carries out the vision for space exploration, the Education Enterprise remains committed to working closely with our nation's schools, fostering learning environments that will stimulate students to participate in the journey to go to the Moon, Mars and beyond," said Dr. Adena Loston, NASA's Associate Administrator for Education.